Wow – what a Masters that was. 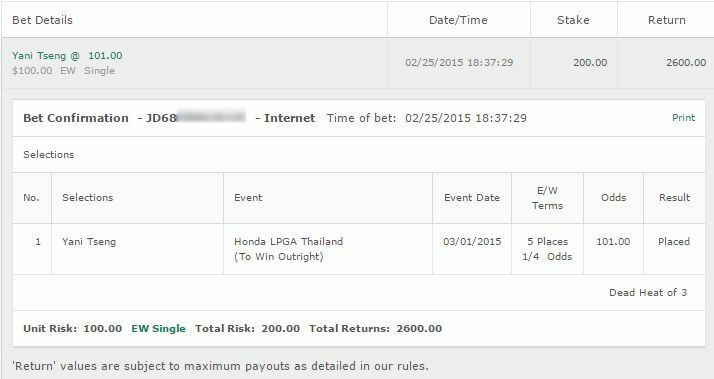 We had Justin Rose to win and thankfully had bet him each/way as well so we had some place money for him. 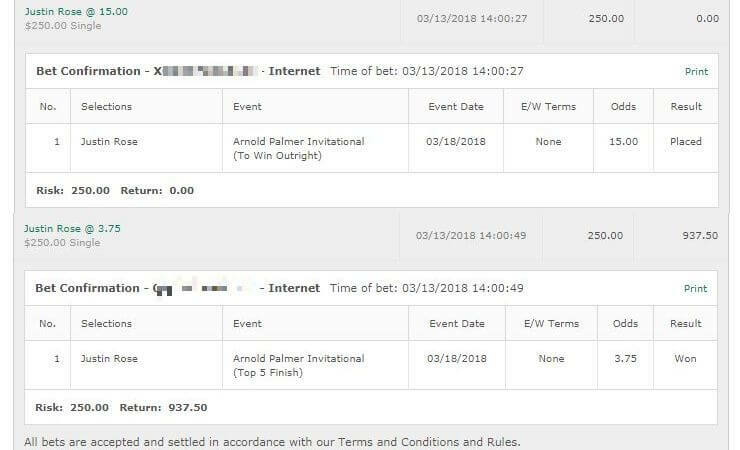 However I’ve always said that golf has some incredible variance, and that at the end of the day all I want with the tips is to be in contention on the final day. And boy were we ever. Rose put in an incredible performance but Garcia deservedly won that one. We were unlucky as we were looking good Sunday for quite a few cashes. Then Spieth crapped the bed, and we had a couple of other contenders fail. Oh well – what a tournament that was and I was spot on with the Rose pick at least so that’s something. It’s a new week and a lot of golf. 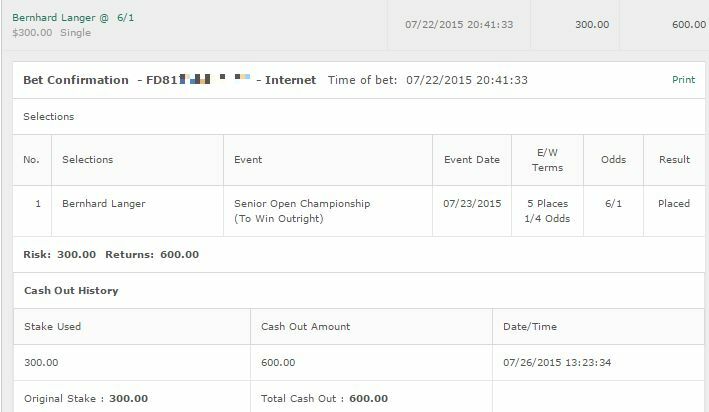 To be honest I much prefer the non-majors when it comes to betting anyway. I find events such as the Masters have too much focus on them. This is a course that generally suits a particular golfer. Always nice to see consistency at a course. Jim Furyk: I’m on the multiple time winner Jim Furyk for a quarter unit to win & E/W. Furyk isn’t in form but oh man does he have an incredible record here with multiple top 10 and top 5 finishes. He’s had a torrid time of this season to be honest and so I’m only going to risk a quarter unit on him. The odds are just too good. Branden Grace: Speaking of owning this course – Branden Grace has performed twice here and came 7th and 1st. he’s coming off a solid Masters apperance where he finished +3. More importantly was he got better as the tournament was going along. He got cut at the Masters last year and bounced back with a win and his pre-Masters form was similar. I think there’s a good shot and I’m going with half a unit to win and E/W. Luke Donald: 6 Top 3 finishes in the last 8 years. Not bad at all for Donald at this tournament. What’s most important is the variables don’t seem to affect that. Whether he played in the Masters or not, whether he is in form or not – doesn’t affect it. I’m on Donald for half a unit to win and E/W. William McGirt: Some strong performances here in the past and his current form have me looking at McGirt. He’s worth it to win and E/W for a quarter unit. This is a rather tricky one. This course has only been used twice and it makes it a bit tricker for the betting tips. For the most part I’m betting this tournament for fun. Just something to watch in the mornings basically so you may want to skip it if you don’t do casual bets. I’m on Robert Rock, Nacho Elvira, Chris Hanson to win and E/W for a quarter unit and that’s it. And I really don’t expect much from them. No LPGA or Champions Tour tips.